I just slapped in a battery and a shorting plug... The battery is a 2100mAh 11.2v last flight, I came in with throttle barely engaged, flaired and it dropped into the snow, no roll. The flight was about 5 minutes in duration, just enough to do some loops a few rolls, and several low passes. I was not terribly impressed with the rolls, they seemed sloppy, but this could have been the loose nut behind the steering wheel. Next flight I do will be to see if the ailerons roll the plane a little more cleanly.. from there I will play with different batteries more to adjust the CG (bigger heavier CG will move forward/smaller lighter shift back) than to evaluate power. I've been thinking about the "Float" condition you describe, and I did experience it. An easy fix would be backwards flaps.... It is so light that having the ailerons droop on approach would probably be counter productive... If , however the ailerons flexed upwards, it would probably require a bit more up elevator and cause it to drop out of the air a little quicker... just a thought.. proceed with caution at your own risk. Has anyone tried using the Mix function on ailerons in order to tinker with adding reflex so that the plane doesn't float on landing approach? I've tried both flaperons and spoilerons. I rather prefer the spoilerons to, as you say, add 'reflex.' It still floats, but not as badly. I've just begun testing adding some down elevator to the mix for a decent approach with so far mixed results. Glad to see someone else is tinkering around with this stuff. Let me know what you think? Wondering about about putting a Heads UP RC 450 Speed in a Mini Pulse XT. Only real difference I can see between that and a Park 450 (other than $27) is that the HURC is 1200 Kv and the Park is 890 Kv. I realize most everyone is saying go with a 480 rather than the 450 but for right now the 450 is a better choice for me. Any thoughts on this, from anyone, please? I did manage to get a 20 minute flight in on this last Saturday with a wind that was about 12 kts. With this wind the landing was very smooth almost bird like floating in to my feet. One thing I did notice was the plane with its out of the box motor has more than enough power, almost too much. I had to fly maneuvors at half throttle or the plane was just going too fast. First quarter of a loop I would bump a little additional throttle, but latter half, throttle was cut back. I found aileron to be way too sensitive around center, so I'll be programming in exponential. I never got to the more advanced moves since I used the back half of my flight envelop for practice approach/TnG's and landings. Last weekend's flights taught me the necessity of having exponential as an option, expecially for T/O. The plane came off the ground rather quickly, surprising me and I over controlled to correct a dropping left wing tip only to have the right pointed at the ground. All flights to date would seem to indicate that the factory set up gives plenty of throw , maybe too much throw. So last nite I programmed the DX7 Ele/Ail switches to provide Exponential. I probably did it incorrectly, as I have normal linear throw when the switch is in the "1" and expo when you move the switch up to the "0" position. It doesn't really matter as initially, I only intend to use expo for take off. May change my mind with some additional stick time. I have it set at 75% and would like to know what others are using? Well, I just did exactly that. My PNP 450 gave up the ghost, must have a shorted wire. Thought I'd splurge on a Hyperion, but couldn't find the right one in stock, so after 90 min of frustration, I went with the easy and reliable option: Jeff's Park 450 Sport at HeadsUp RC. I believe this is a Suppo motor, and I was very impressed with it's brother, the Park 480. This Park 450 drops right into the MPXT, but the shaft and prop adapter are slightly longer than the PNP's, so I'll have to cut the standoffs to close the spinner gap. After 2 flights today, I'm very impressed with this motor. It's vastly superior to the flimsy E Flite PNP 450 (which sells for something ridiculous like $80even more than the "real" 450. [X(]). With the TP 9 X 6E prop from HeadsUp, it now will knife edge all the way around the field with ease. (The E Flite PNP limped along making ugly vibration and prop noise for about 50 ft before it lost too much altitude to continue). I'm not sure if vertical is unlimited, but it's very impressive. All this with equal or better flight times. My quick initial Amp draw check indicated almost exactly what Jeff claims with this prop: 17 Amps. (Jeff's test says 18 Amps, maybe his battery was better. Mine was a fresh Thunder Power Pro Lite 2100 so it should be good). 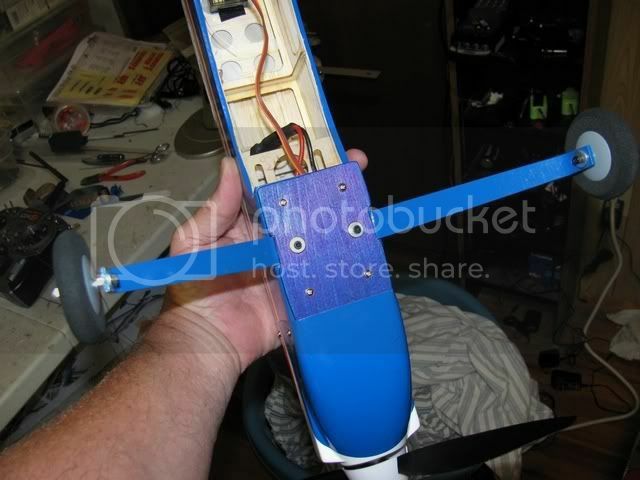 I would not use 10 inch props with this motor. They barely work with the E Flite 890 KV, and this Suppo Park 450 is 1100 KVit would surely burn up. It works GREAT with the TP 9 X 6 (an APC clone) on the MPXT. I'm totally pleased with this purchase. One more satisfied customer for Heads Up RC. It sure beats the price of the E flite stuff, despite being equal or better quality. I'd love to try a Hyperion some day, but I must say, they sure don't make it easy to choose the right motor! The Heads Up site cannot be beat. I see no reason the fuss with the Park 480. The one at Heads Up is nice, but even heavier than the E Flite 480, and would require fabricating a new mounting plate. I just don't see the need. The Heads Up Park 450 ROCKS! That recovering scheme is so beautiful and aweso..... AWWWWWWW! I feel for you. Really though, kudos for doing something creative with the covering. I love(d) it. Not taking any chances on this super looking mini-Pulse XT model. Last time I flew it I had commanded it into a Left hand turn right at the edge of the RC field and near a large man made lake shore. Well, I am glad that I had enough ALTITUDE because the dang thing just maintain it's turn for about 4 seconds and that was just too much time for me! During the turn I commanded it to straighten out and didn't respond. 1. Replaced the Orange Receiver with dual antennas to the newer Spektrum AR-400 with amplified Antenna whip. 4. Since this Spektrum AR-400 had been previously bind to Model #1, I had to go into a little programming to eliminate the previous model's setup information and adjusted servo reversing for ailerons and Elevator. Reduced the EXPO on the Ailerons as they had been diminished just too much. Went for 65% instead of 30% on those Ailerons. Now the Ailerons has the throw that I like with the right rate appeal that I am used to. So it looks as if the pulse series is discontinued. Does anyone have info on why and if something might be replacing the best sport plane ever made?